You Are Now Entering a Time Warp! The Joides Resolution sits in a time warp all of its own! There is no daily change of noise to register the daily routine – just a constant, 24 hour background din of the drilling and thrusters, no rush hour traffic at the beginning and end of the day, no dawn chorus or evening songbirds to mark the passing of time. Ship time runs on its own clock, seemingly independent of the rest of the World. There are 12 noon – midnight – 12 noon shifts and 6.00am-6pm-6am shifts around the clock. When I get up to eat my breakfast, others are having their lunch, while others are eating their evening meal after they have finished their shift, ready to wind down before bed. The ‘night shift’ who start their 12 hours at midnight gather together a record of sunrises while the day shift balances the books with a record of sunsets. It is hard to tell the difference from the photo sets but perhaps we should just swap a few? The days come and go, the weeks come and go, sliding into each other without the weekly pattern of weekends or half-day holidays. Does it matter if it is Monday or Thursday or Sunday? Every day has the same routine that doesn’t follow the body’s natural rhythm of getting up at dawn or going to bed in the evening. The day shift actually works and plays on different days. Finishing at midnight, our recreation time is always in the early hours of the following day, and it is really hard to judge when you should be going to bed. You don’t get up until lunchtime when the sun is high in the sky and the world already feels like it is full swing, and 4 o’clock in the morning when the sky is just beginning to lighten towards the dawn feels like you have stayed up ‘very late’ indeed! On top of that there are global timezones to contend with. Contacting your own family is bad enough, but co-ordinating a list of 6 or 7 schools, from different countries around the World into a 12 hour period that includes two dates (over midnight) is a mental challenge in itself! 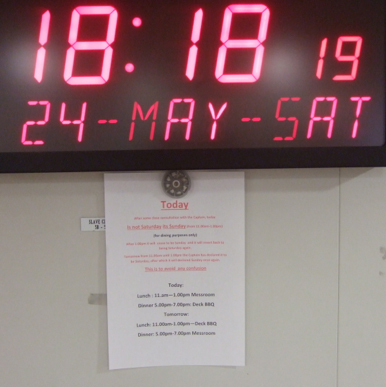 We have to take into account their UTC (Coordinated Universal Time) which can also be designated GMT (Greenwich Mean Time) plus or minus so many hours; Australia has 3 time zones and no daylight saving time (DST); Iraq came onboard for the first time and it also has no DST but the UK and Europe do; Japan is the same timezone as the ship – without DST; the US has 4 timezones with DST, plus Hawaii which doesn’t. On top of that, schools in the Western USA are booked into our post midnight slots (ship time and day) while their booking is for the previous day! We have to constantly check and re-check and send carefully worded emails that include ‘your time’, ‘our time’, ‘your date’ and ‘our date’. We have achieved all this without any mistakes (so far!) but only by re-checking enough times to find our errors before they happened! But for a minute lets get back to food – food is a very important part of life on board the JR. It is one of our main sources of comfort, and it also helps you to keep track of time. The Mess clock actually tells you the day of the week as well as the time, and you can set your watch by the next mealtime – every six hours, and regular meals throughout the week (Friday Pizza anyone?) until now! After 1.00pm it will cease to be Sunday and it will revert back to being Saturday again. after which it will be declared Sunday once again. And all in order to put on an extra BBQ at a more convenient lunchtime (or is it dinner time?) for the dayshift. At least we all managed to find our way to the BBQ area in time to eat! Now, when was the muster again?